Hnefatafl is an ancient Viking/Scandinavian board game similar to chess. History has it that the game was played as far back as AD400 and carried well into the Dark Ages and beyond. Its popularity supposedly reached as far as the 1700’s and then the game chess outgrew it. Hnefatafl translates to mean “Kings Table”. Today it’s making a comeback in certain areas and among certain groups of people. The game has been showcased in various Viking shows in recent years. Personally my wife and I play it often and love the game. I handcrafted this piece of art, one of a kind Hnefatafl board using brain-tanned goat hide/leather, jade, amber and cowrie shells. 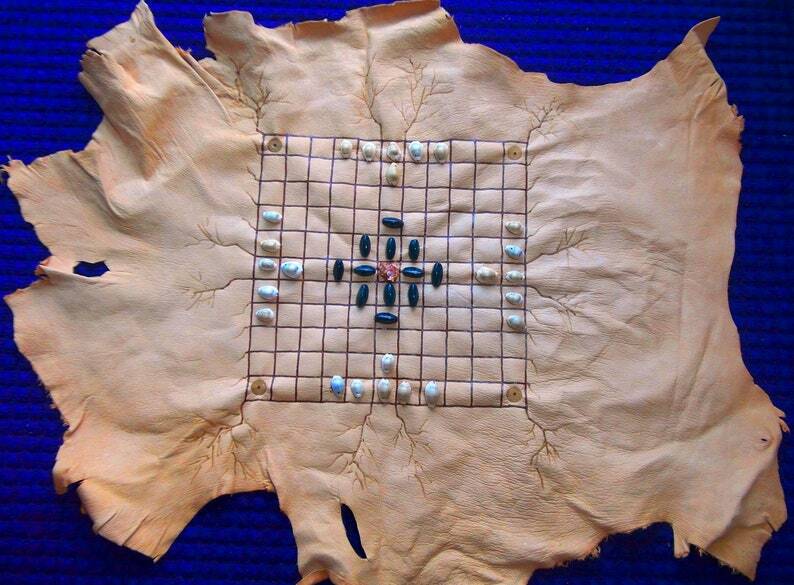 The game board is burned into genuine brain-tanned goat hide/leather. The King's pieces are polished green jade. The King is a rough cut piece of genuine amber and the opponent pieces are genuine cowrie shells. This is not a kit, nor stencil, or laser work. The whole board was hand designed, hand drawn and hand burned. The hide measures roughly 20x32 inches and the game board measures 11.5x11.5 inches. This is an easy to carry game as opposed to the large wooden boards I craft. It rolls up and tied with black leather strips. The game pieces fit inside a black bag that can easily be rolled into the game board itself. The name of the game, Hnefatafl is burned into the back of the playing board. If you like chess, you’ll love this game! If you enjoy quality, unique and handcrafted games then this one is sure to find its way to the showcase table of your home, office, club or game room! Scandinavian bloodline or not, this game is fun for anyone old enough to manage the rules of chess. The Kings Table awaits you – Hnefatafl!